Information and Mutual Aid model | Alzheimer Society of B.C. One of the ways that people experiencing difficult situations can find help and relief is through meeting with others in the same situation as themselves. These groups rely on the experience and support of members more than on the knowledge of experts. The group is based on people talking as equals as opposed to being lectured to by an expert. Members are encouraged to take an active role to ensure that all the tasks necessary to maintain the group are carried out (welcoming group members, making coffee, reminder phone calls). The Alzheimer Society of B.C. provides support groups with reliable information that can be used to supplement and affirm the information offered among members. 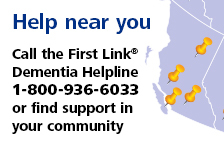 This information is presented by support group facilitators and Alzheimer Society of B.C. staff, and may include brief presentations, handouts, newsletters and information sheets.